Be it as a landscaping tool, in planter boxes as mulch, in water features, as edging to driveways, in garden beds and ponds... pebbles are nothing if not a versatile option for your outdoor living spaces. With so many different colors and sizes available, using pebbles in your landscape is limited only by the imagination. And while black, grey and white are the most popular pebble colors used in landscaping, there are exotic imported varieties, particularly from Asia, such as spectacular jade ones. Choosing the right color depends on the look you are going for. Blacks and grey tend to blend in, whereas white stands out and gives striking contrast particularly when teamed with different-colored grasses such as rust colored or silver ones. Part of the reason why pebbles are so popular is because of the need to be water wise in most parts of the country. Another major factor in the rise in popularity of pebbles is that people don’t want to put time into mowing lawns, so pebbles provide an excellent decorative alternative that is low cost and low maintenance. Pebbles truly are an inexpensive landscaping option, with prices ranging from between $90 and $300 a cubic meter. Price is often determined simply by freight cost and the distance they have to travel, so using local varieties and local suppliers is often the most budget-friendly option. Use pebbles as an alternative to organic mulches for planters. Mulching is essential in the hot Australian climate. Its purpose is to enable soil to retain water and to minimize evaporation. Pebbles are an excellent alternative to traditional mulching products. They allow water to penetrate to the roots of plants, while still enabling the soil beneath them to stay moist. Unlike mulch products, such as bark or woodchips, pebbles don’t ever wear out or break down, which means they are a far more durable and costeffective solution. In addition, whereas some woodchips can change the pH of the soil, pebbles will not. And while woodchips, bark and other organic materials used for mulch will fade, deteriorate and look messy over time, pebbles will continue to look good long after they’ve been laid. Polished pebbles, which mainly come from China, are quite in vogue right now. They are very striking, particularly in planter boxes. The shiny, waxy coating will come off after repeated exposure to sun and rain, so they’re best suited for areas that are undercover — or indoors. 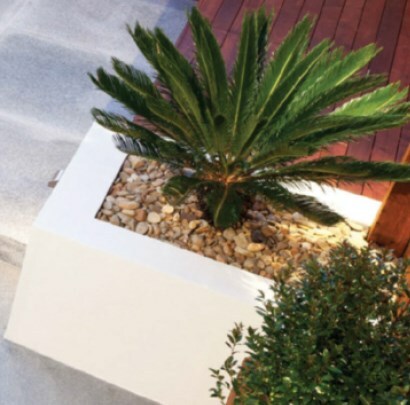 Stark white gives excellent contrast to foliage and can also create a dramatic visual effect, while grey has a look of sophistication about it and creates a more subtle effect in a garden or pot. 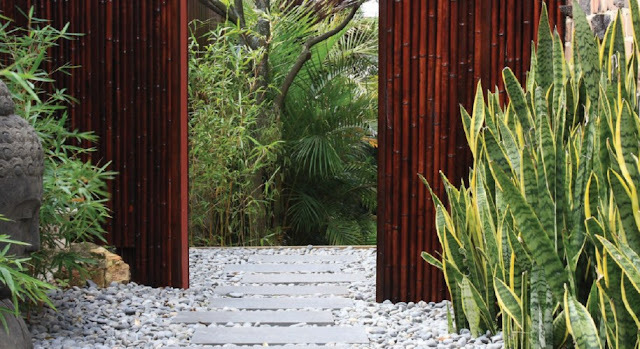 For native gardens, pebbles in browns and earth tones are the perfect fit. Pebbles are an easy way to enhance your landscape both practically, in terms of maintenance and being a water-wise choice, and aesthetically as a stylish designer option for added color, interest and texture. in water features for added texture and color. Choose the color of the pebbles to enhance a themed outdoor design, such as white pebbles in a Japanese-style garden. Place pebbles on the bottom of a pond or at the base of a water feature to add to the natural ambience. You can also place pebbles around stepping stones or along the sides of garden paths to highlight the pavers. Use pebbles as an alternative to lawn in areas such as small side courtyards or under established trees or shrubs. Pebbles can also be used in mosaic work. You could create a mosaic step or a prettily patterned garden path. 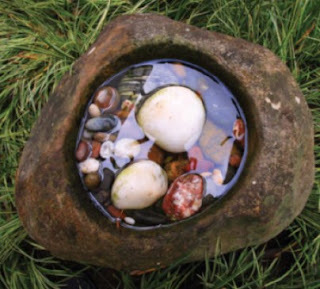 Pebbles of various sizes can be used with larger stones to create an authentic-looking dry creek bed. You can use pebbles as an alternative to traditional mulch products, such as woodchip sand pea straw, in either gardens beds or planters. Coordinate the color of the pebbles to match your outdoor decorating theme.